Product code: ES3514 Categories: Sold Items, Sold Jewellery. This lovely elegant Art Deco brooch is made in 15ct yellow gold and platinum and dates from the 1920’s. The simple elegance of this Art Deco brooch makes it so wearable day or night and will always look so refined on any outfit. Set with a lovely sapphire on either side, the brooch is further highlighted with a total of 17 rose cut diamonds that graduate so elegantly in size. Along the edge the diamonds have been milgrain set which can be seen as the elegant crimping typical of Art Deco jewellery from this time. 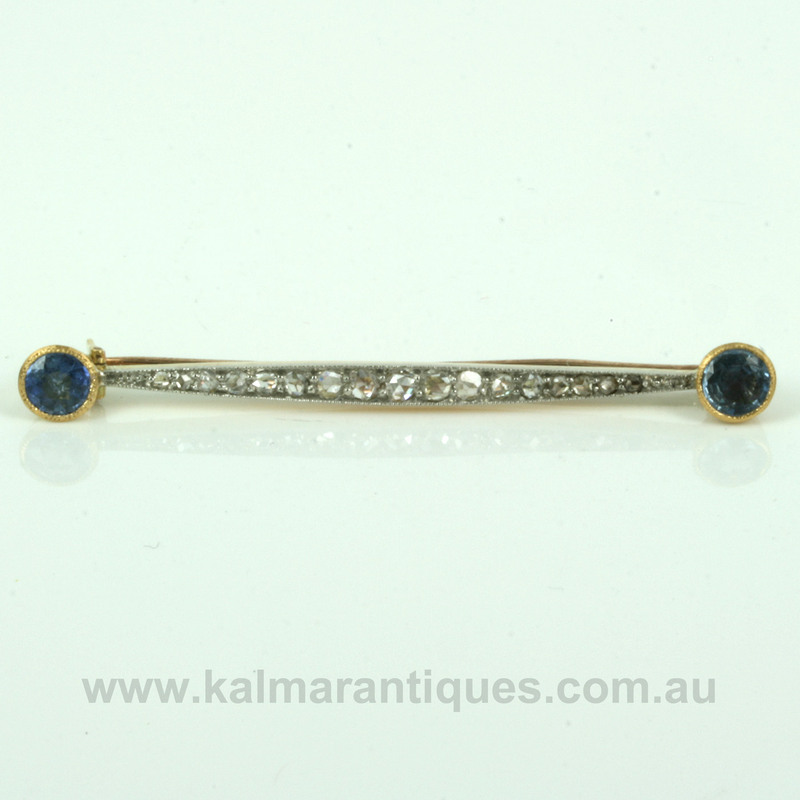 From one end to the other, the brooch measures 50mm in length, and the straight design will also allow this Art Deco brooch to be worn horizontal or even at an angle. With a safety catch that is so ingenious on the reverse to secure the pin, this wonderful example from the Art Deco era will look simply stunning when worn during the day and through to the evening.